When bottom level guys look up, they only see assholes. 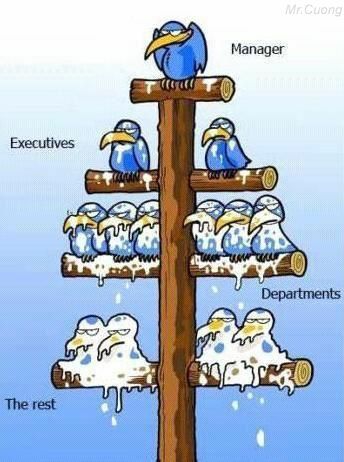 Lammy, my number 1 blog commenter these days, shared with me this funny comic about the way management structures actually work. But Lammy, please realize this is probably written or drawn by the guy “at the bottom”. I think most staff think its so easy to be a big boss, don’t have pressure from a boss to get work done, can have the worker do all the work. There is the saying – be careful what you wish for. And there is the idea, maybe there isn’t as much daily tasks and work, but there is RESPONSIBILITY and long term pressures. I can remember when I was working at Deutsche Bank – there were some high level execs that we would never even see on the floor, they would walk in, pop to their corner office – shut the door – conference call, a couple meetings, and head out again for a sales meeting or something. This was annoying. I think it is important to show face time……and to have everyone realize the pressure and stress. But then again, big business is different then small business. Investors pressure – if you take OPM (other people’s money) as a manager, you are gonna get them asking a lot of questions, very often. Not just getting in sales, but managing those budgets, operations, people, PR, the list doesn’t end. You are their face, the one responsible. Political pressure – Government, keeping good filing – especially in China, have to keep all these reports in order, monthly filings, contracts, documents, the list doesn’t end. Accounting pressure – Similar to government, but keeping receipts, records – proof of orders, supplier information. And in the past, so many big corporations “cooked the books”, squeezed things in, stretched it as far as they could….its getting to be more and more red tape for the rest of us….everything is scrutinized. Again, while these top execs may not be doing the routine work, and may not be seen all the time – it is their reputation and name and credibility on the line. sometimes I wish i could take the pressure off….every day its pressure. Sure, so many critics can say its easy to be the boss…..and they can do better – HAHA – I challenge it, and support it.